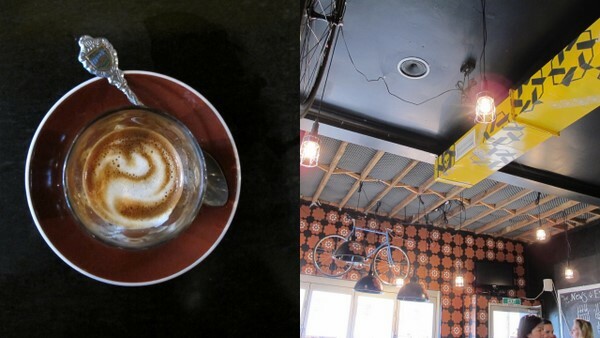 Bikes and coffee and hipsters – seemingly unrelated things come in threes. Why? Who knows, who cares. As puzzling to me as Shirt Bar was the other week and no less delightful, Lonsdale Street Roasters (or LSR as it is known) meshes this triad of seemingly random objects (yes, hipsters are indeed objects) except to me, coffee roaster+bikes+hipsters=café, where shirts+whisky+coffee=scratching my head a bit. I think it’s safe to say LSR in the only so-cool-it-hurts espresso bar in the ‘berra, a city renowned for it’s roundabouts, public servants and, oh hang on a sec, bicycle paths. 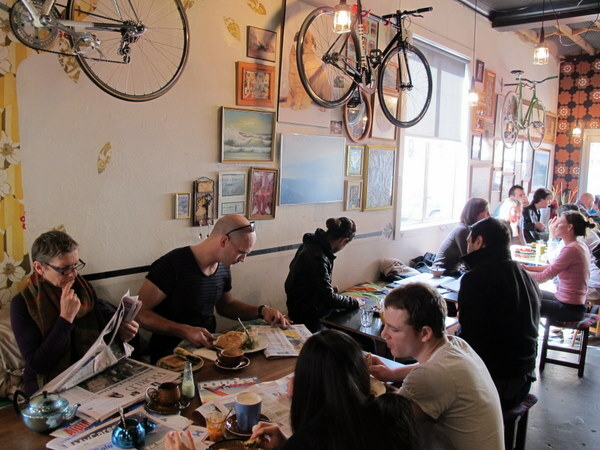 Bicycles hang from the ceiling, yellow and white magnetic letters spell out the menus, all the staff are under 25, artfully arranged bric-a-brac adorns the walls. It ticks all the boxes, the only thing missing is the Astroturf. 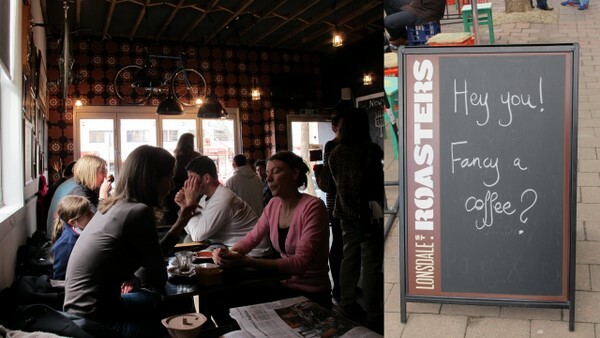 LSR pretty much serve coffee, as they are predominantly a coffee roaster. But they do have a smattering of breakfast, cakes and sandwiches with fashionable fillings (slow roasted pork with chipotle, anyone?). It’s order-and-pay-at-the-counter. If there’s no room inside (and I pray if you go anytime other than Autumn, there is), perch yourself on a milk crate outside. I order a macch and Mum orders a cap, before realising yet again that that’s not what she really wanted, but as always not caring enough to change it. As expected, they do that thing that shits me where instead of 1/3 espresso 1/3 milk 1/3 froth dusted with chocolate (let’s call it an Australian cappuccino), they latte art the hell out of it so it’s basically a flat white with chocolate. Which is fine in this case as it’s not really what was wanted anyway but surely the point of a cappuccino is the foam, micro or otherwise (please not this is a generalised rant and not aimed at LSR specifically). Of course, swings and roundabouts, anywhere you get a flat ‘cappuccino’ like this, I get a super short and concentrated macch, just the way I like it. So really, I can’t complain. Well, I will, but only on principle, and only in the safe confines of the blogosphere, never to anyone’s face. Good to know there’s halfway decent coffee in Canberra. I’ve had only bad ones so far. lol – flat’caps.. they’re really just an excuse to eat the lovely chocolate on top aren’t they? I wonder if these baristas realise a beautifully made cap with a thick layer of chocolate can be much better looking and appetising? Had read recently that Canberra is a coffee dead zone so pleased to learn it isn’t! As for the cap question – at the cafe I work at (in London) you’d be served something very similar to LSR. But if you asked for a dry cap (with choc on last) you’d get something closer to the old thirds-recipe. Never order a cappucino in Tasmania. It’s either weak rubbish or totally flat. Lucky for me the piccolo has finally caught on here and I have discovered at least 2 places that can make a decent short mac.